Yesterday’s rally in the dollar cad pair was somewhat muted given the sharp sell off in equities and commodities as the session ended on narrow spread up bar with a deep upper wick suggesting a move that lacks conviction, a view reinforced by the fact that the high of the day failed to breach the 40 moving average which seems to be adding some downwards pressure at present. 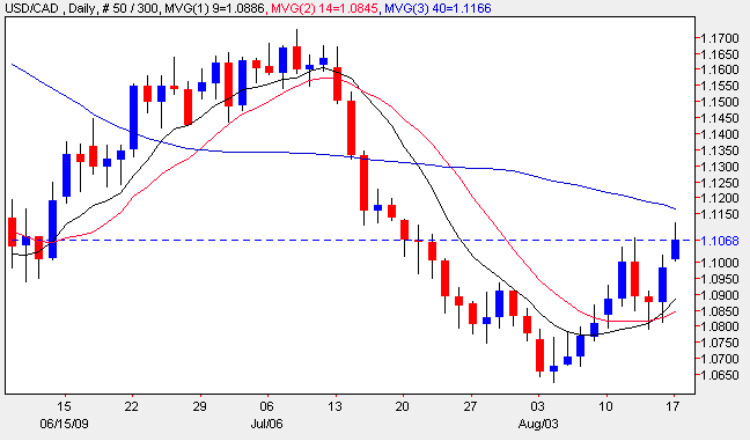 It is also interesting to note that the prices today failed to clear the minor support level at USD1.115 which remains intact at present and any sustained move higher will need to breach this level as well as cross the 40 day moving average. The only item of fundamental news on the economic calendar today for Canada is the Foreign Securities data which is forecast at 13.55bn, a figure that has been rising, month on month and if, once again, this number comes in better than expected should boost the Loonie. Meanwhile in the US we have Building Permits, PPI, Core PPI and Housing Starts and of these the two most interesting are the PPI which is expected to post a negative number at -0.2% indicating that deflation is still posing a risk, and Building Permits which the markets will be scrutinizing to see if the housing market has indeed reached a bottom. In contrast to the PPI data both Building Permits and Housing Starts are expected to show a very small improvement over last time with Building Permits rising from 0.57m to 0.58m and Housing Starts from 0.58m to 0.60m. However, forex traders may focus on whether the PPI does indeed come in at a negative number as this would signal a postponement of any rise in interest rates which would be bad news for the US Dollar.